She's a single mother of three children and maintained her dignity through her recent love-split. 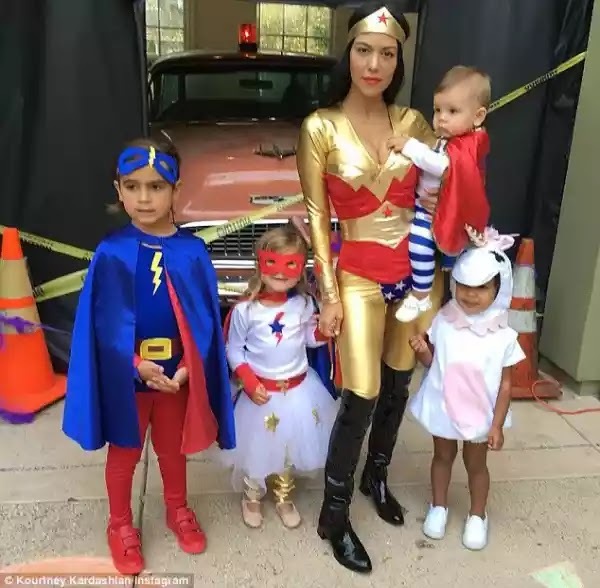 So a Wonder Woman costume certainly seems appropriate for Kourtney Kardashian. wearing fancy dress on Saturday. The 36-year-old showed off her impressively svelte figure in a gold catsuit with red embellishments. She added saucy knee-high boots and completed her look with the DC comics superheroine style headband. Her three-year-old daughter Penelope held her hand, dressed as a cute mini-me version of her famous mother.